You may think that email marketing isn’t important enough to have its own part in the audit, but it in fact, has several facets that need to be addressed. Since the audit’s aim is to help you focus on your current situation and how you can improve and streamline it, we wanted to focus on programs you could use in email marketing, emails you could be sending to clients, how to set up a schedule that works for you as well as the next steps to take. 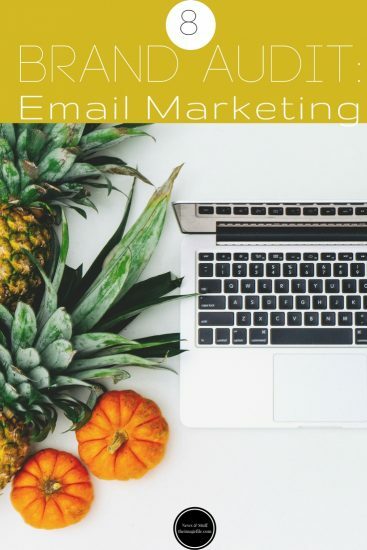 Email marketing programs aren’t for everyone, but if you struggle to manage all your business needs and requirements, they can be a huge help with time-saving and management. There are a lot of programs available, however, some that we would recommend are Mad Mimi, MailChimp and Flashissue. Mad Mimi and MailChimp are, by far, the most well known and for a good reason. They are very professional programs to use and provide everything needed to make some really beautiful email campaigns. However, a word of caution. MailChimp is known for being fairly complicated to use and has required the need for tutorials in the past. Also, be aware that both Mad Mimi and MailChimp are paid-for programs. On the other hand, Flashissue is incredibly user-friendly and easy to use, with a simple drag-and-drop function. But equally, be aware that you cannot customise your email campaigns quite as much as with Mad Mimi and MailChimp. Try to email your clients on a fairly regular basis, but without overwhelming their inbox. By mixing up the content of your emails you’ll be sure to keep them interested. This might seem obvious to some, but it’s important to try and set an email marketing schedule. You don’t have to stick to it religiously, and of course, at certain times of year business will be busier than others. However, making a conscious effort to stick to a schedule, such as emailing clients weekly, fortnightly or monthly, will make email marketing easier to maintain as well as give your customers a routine to look forward to. If you aren’t already using an email marketing program, then take a look at Mad Mimi, MailChimp and Flashissue. Go through your calendar and schedule for at least one month of email marketing. Think about important days that are coming up, for example, Mother’s Day, and be sure to schedule some promotional content around them. Also, make sure you schedule in a regular time to send out a newsletter to customers. This is particularly useful if you have a blog to link back to. Not sure what to send customers? Have a read of our 7 Types of Emails Your Should Be Sending for some inspiration. If you are brand new to our brand audit series then be sure to go back and have a read of our previous articles, including business goals, services, content, functionality, products, SEO and visual identity.